Was WWI-Era Britain The Birthplace Of The Session Beer? The British have a pretty fantastic track record when it comes to keeping their armed forces buzzed: the British Royal Navy got rations of overproof rum in the 18th century; there were floating breweries for World War II-era British navy stationed in the Pacific; and to this day, Naval officers who’ve failed the Submarine Command Course (aka “The Perisher”) have traditionally received a bottle of whiskey. So the theory that “session beer” comes from a World War I-era British military practice doesn’t surprise us a ton. But is it realistic? The basic idea seems plausible. During WWI, the British government rationed beer to its soldiers. Not all of its soldiers, of course, and not all of the time (nobody currently in charge of a large gun was allotted a pint). Most stories actually involve beer being doled out to munitions workers, the people who assembled and maintained ammo for soldiers on the field —people sufficiently far from combat to crack a few brewskies. The workers were supposedly given beer during two designated periods, or sessions: 11 am to 3 pm and 7 pm to 11 pm. The British were so serious about this beer ration they actually wrote it into law (the law wasn’t technically taken off the books until 1988, and we’re hoping some 20th-century workers knew about it and demanded beer breaks). Because they were doing pretty delicate work — we’re not supposed to operate heavy machinery, let alone heavy artillery, while intoxicated — the munitions workers were given lower-alcohol beer. Beers in the range of 3% or 4% ABV. Beers that could keep a worker chipper, upper-lip stiff and such, without interrupting the flow of ammo to the war front. Thus we get to the modern-day drinking (and marketing) concept of the “session beer,” perfect for several hours of low ABV beer consumption. A good story, not least because mildly buzzed ammunitions work during WWI would have had to do a lot of incredibly heavy lifting. And it probably has its roots in truth, but still, there’s something a bit off about it. Maybe it’s the fact that the “sessions” both lasted four hours? Anyone who’s sat down to more than a couple mid-range ABV beers knows that, unless that beer is ridiculously low alcohol, four hours is more than enough time to reach a point of blithering intoxication. Four hours of session beers and you’re looking up your junior high school science teacher on Facebook or insisting on the social propriety of karaoke at 3 pm. Add to that the fact that the actual break between sessions was only as long as a session itself, four hours, at least half of which would be spent sobering up (and we doubt egg sandwiches and coconut water were distributed in WWI England). 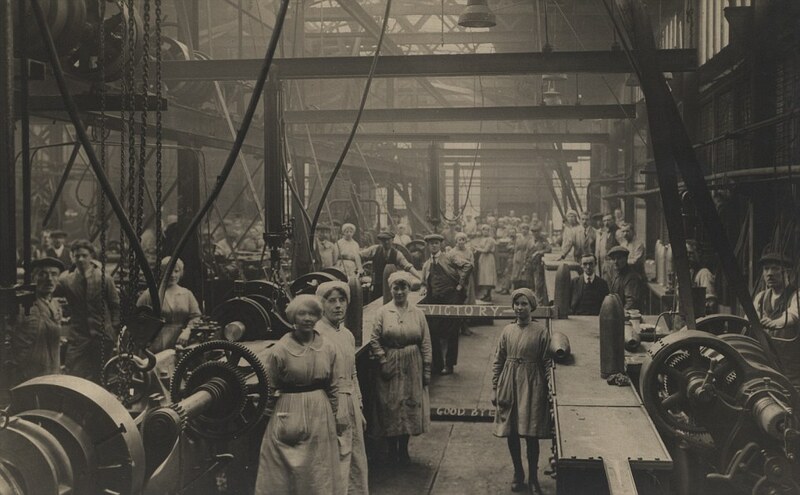 One reason we do hope the story is true: munitions workers in WWI-era England were largely female. So-called “Munitionettes,” women who took roles vacated by men in munitions factories to supply the British forces with arms (if you want to see some really cool archival footage, clips from a 1917 “Day in the Life Of,” check here). And since at least one recent book on the subject insists women in England first started going into pubs during WWI, maybe there’s some truth to the session beer story. According to a study of British female drinking habits by modern British history Professor David Gutzke, “during World War I respectable upper working-class and lower middle-class women, who had shunned public drinking for almost a century, began patronizing the pub in unprecedented numbers.” If women were going into pubs during WWI, there’s a decent chance they were drinking on the job, when legally offered, that is. Which would mean it was quite possibly women (women holding bullets, no less) who started the session beer tradition for the rest of us, just about 100 years ago.